There has been much talk recently of an economic comeback in Ohio since the 2008 financial crisis. Ohio was notably hit hard by the economic downturn. Now we constantly hear about Ohio’s rising tax revenues, a Budget Stabilization Fund balance of over $1 billion, and a slowly falling unemployment rate. In fact, a recent study by the Mercatus Center at George Mason University has become widespread because it ranks Ohio as the state with the seventh best financial condition. It’s all a rosy story, but it’s not true. Ohio’s economy has not been recovering since the 2008 collapse. In truth, based on an ignorance of business cycles, Ohio has made many of the same mistakes that led to Ohio’s economic problems shortly after the 2008 crisis. Those mistakes have set up Ohio for even worse economic troubles in the next economic-wide collapse. 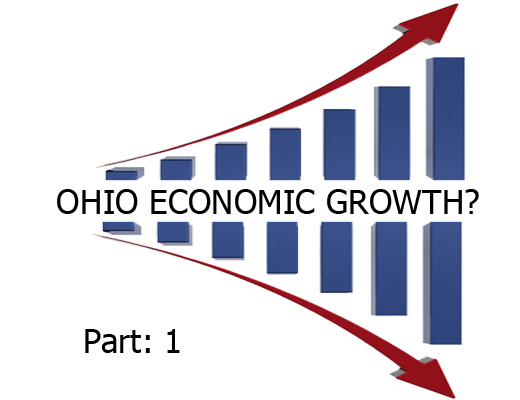 In order to understand the true state of Ohio’s economy, we must once again first visit the concept of business cycles. As previously explained on OCR, the Federal Reserve (“Fed”) creates boom-bust cycles in the economy through the manipulation of interest rates. The Fed is able to manipulate interest rates throughout the economy by influencing the Funds Rate, the interest rate that banks charge each other for short-term transactions. When the Fed artificially lowers interest rates, a fictitious economic boom is created. The artificially low interest rates mislead businesses and entrepreneurs to invest additional capital and labor into various production projects. Similarly, consumers utilize the artificially low interest rates to take on more debt for consuming houses, cars, and other goods. As banks loan out more and more money, the money supply increases through fractional reserve banking. The economy feels like it is growing. The economic boom is a false promise of prosperity. The boom is not sustainable. Once interest rates start rising and the growth in the money supply slows down, the various investment projects dependent on the artificially low interest rates and growing money supply are revealed as bad investments. Similarly, consumers find themselves facing insurmountable piles of debt. The artificial boom collapses. The economic bust is the market’s attempt to liquidate the bad investments and return the various resources of savings, capital, and labor to better uses in the production of needed wealth. The quicker the liquidation is permitted to take place, the sooner the economy can recover and start growing on a strong fresh foundation. The more the government stops the liquidation, the longer the economy must lag as it attempts to work out all of the misused resources. In short, the economic bust is actually the recovery from the destruction of resources during the artificial boom. Why does an understanding of business cycles matter? Governments also experience the booms and busts of the business cycle. During the artificial boom, the growing money supply leads to rising tax revenues. 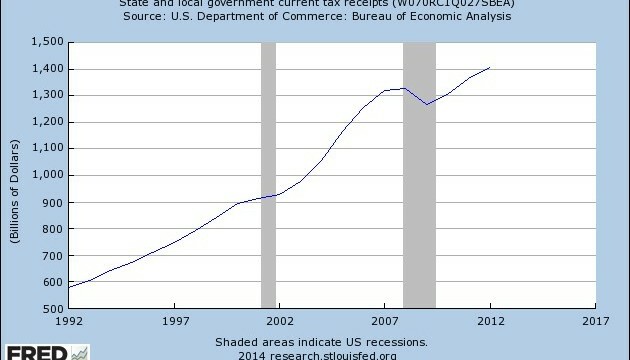 Governments mistake the rising tax revenues as a sign of a growing economy. Thus, governments utilize the rising revenues on various spending projects and long-term investments. When the inevitable bust comes, governments find themselves in budget crises. With a proper understanding of business cycles, many of those spending projects would have never taken place. The Federal Reserve has generated three consecutive artificial booms starting in the mid-1990s. In the early 1990s, the Funds rate was 8%. By 1993, the Funds rate was in the 3% range and the Funds rate stayed in the 4-5% range for most of the 1990s. In 1999, the Fed raised the Funds rate into the 6% range and the economy thereafter went into a recession. Rather than allowing the market to completely crash in response to the artificial boom of the 1990s, the Fed lowered the Funds rate to 1%, spurring a housing boom. Subsequently, the Fed increased the Funds rate to 5%, which eventually resulted in the 2008 crisis. In response to the crisis, the Fed has since held the Funds rate to nearly 0% and enacted its controversial quantitative easing programs. 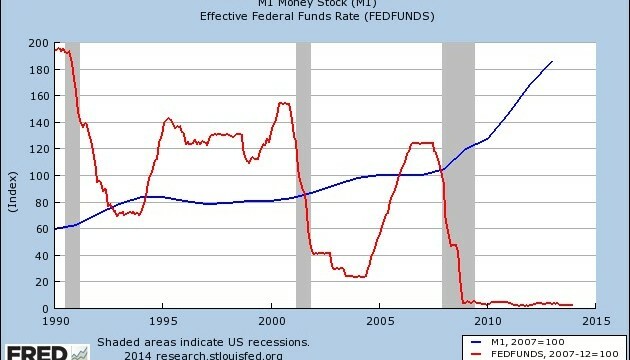 In the below graph, you can see the recent history of the Funds rate in red. 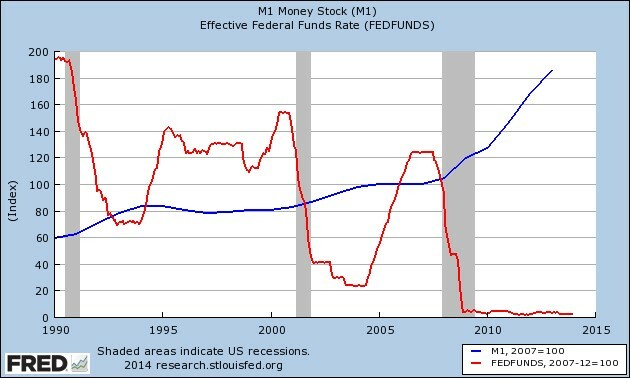 The blue line is the growth in the M1 money supply. As you can see, the money supply grew in the early 1990s in response to the lowering of the Funds rate and slowed down as the Funds rate increased. The money supply once again increased in the early 2000s as the Funds rate decreased and slowed down as the Funds rate went bank up. The money supply has been continually increasing since the Fed reduced the Funds rate for a third consecutive time in 2008. 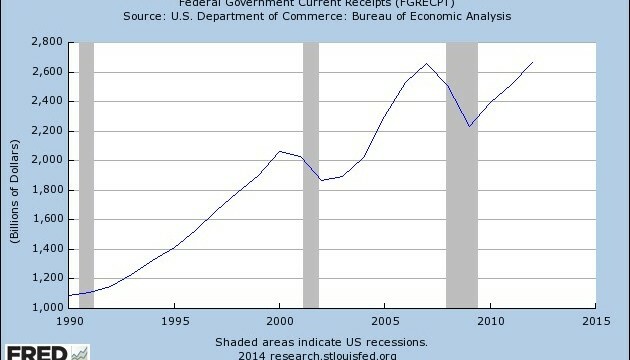 This increase in the money supply has resulted in a similar pattern in government tax revenues. 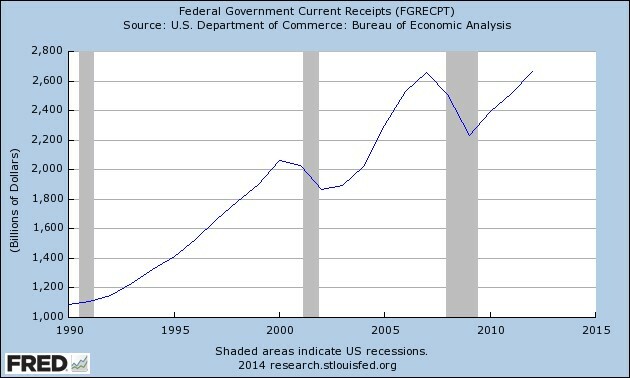 Federal tax receipts increased during the 1990s, decreased in 2000, increased in the mid-2000s, decreased in 2007, and have been climbing since 2009. Of course, the impact of business cycles is felt by state and local governments as well. Tax receipts for state and local governments have experienced a very similar pattern.